The letter that was never opened. 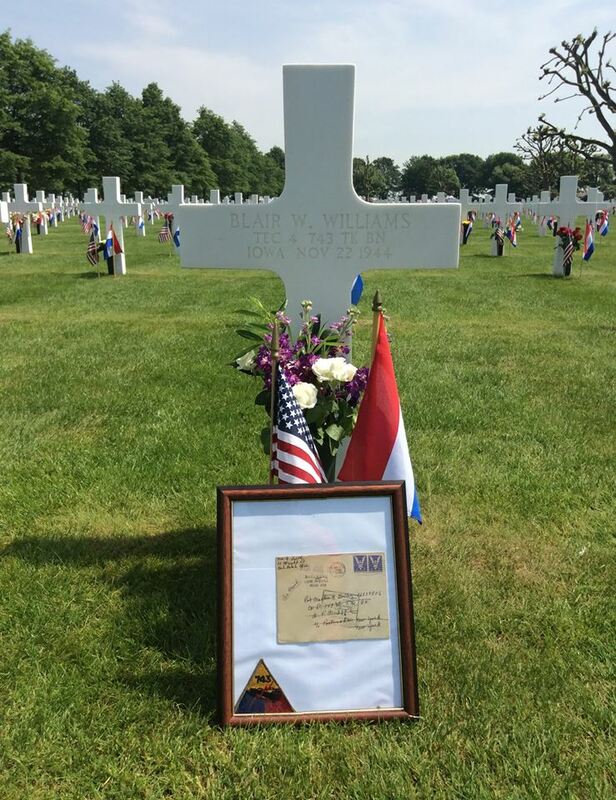 Blair Williams grave by Vincent Heggen, 2017. Netherlands American Cemetery. Here in the United States, Memorial Day will be upon us soon. 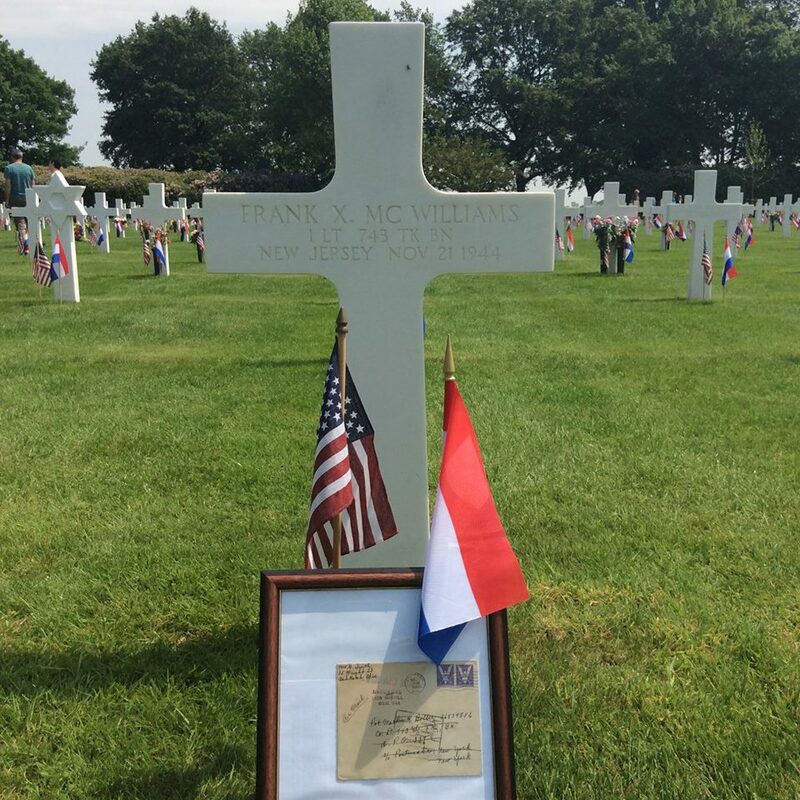 In interviewing WW II veterans over the years, I found that most whom I was privileged to know shied away from honors and recognition on Memorial Day. I was reminded of the sacrifices that the veterans made, again and again, but they all told me that the real heroes were the ones that did not come home. And that Memorial Day was the day reserved for THEM; contrary to popular American opinion, it’s not another Veterans Day. But this weekend we tip our hat to the veterans among us, and post that ‘salute to the troops’, thank them for their service, and we are free to start our summer vacation. Did we just give ourselves some kind of pass? The holiday known originally as “Decoration Day” originated at the end of the Civil War when a general order was issued designating May 30, 1868, “for the purpose of strewing with flowers or otherwise decorating the graves of comrades who died in defense of their country during the late rebellion.” When Congress passed a law formally recognizing the last Monday in May as the day of national remembrance, we effectively got our three-day weekend and our de facto beginning of summer. But do we really want to know? If we do, maybe we can take the time to seek out one of those who fell on those faraway fields, and think about what it means on a personal level, try to find out more about a life that was cut short. Here are a few to think about. In writing my second book, I revisited a horrific incident that occurred in the earliest days of American penetration onto enemy soil in Germany. Resistance was stiff; on a cold and rainy day before Thanksgiving, 1944, 3 tanks of the 743rd Tank Battalion’s ‘D’ Company were wiped out in a muddy apple orchard a few miles across the river. In 2012, I was alerted to the existence of this WWII era letter in a memorial museum in Belgium. The envelope was postmarked Nov. 27, 1944, and addressed from the USA to PFC Marvin K. Boller, D Co., 743rd Tank Battalion. It was also stamped ‘DECEASED’. Co D 743rd Tank Bn was moving from Langendorf to Erberich in November, 1944. It kept raining the whole day before they arrived in the orchards near Erberich. It was 8h20 when a German tank opened fire and knocked out 3 light tanks… All the crews were killed and a few of them are buried at the cemetery of Margraten. The letter, in front of the graves , was written by Marvin Boller’s wife. Marvin was killed just the day before Thanksgiving and the letter was marked ‘return to sender’. The letter made the link between the crew members of Marvin’s tank buried here, and Marvin who was buried [elsewhere]. Frank McWilliams grave by Vincent Heggen, 2017. Netherlands American Cemetery. 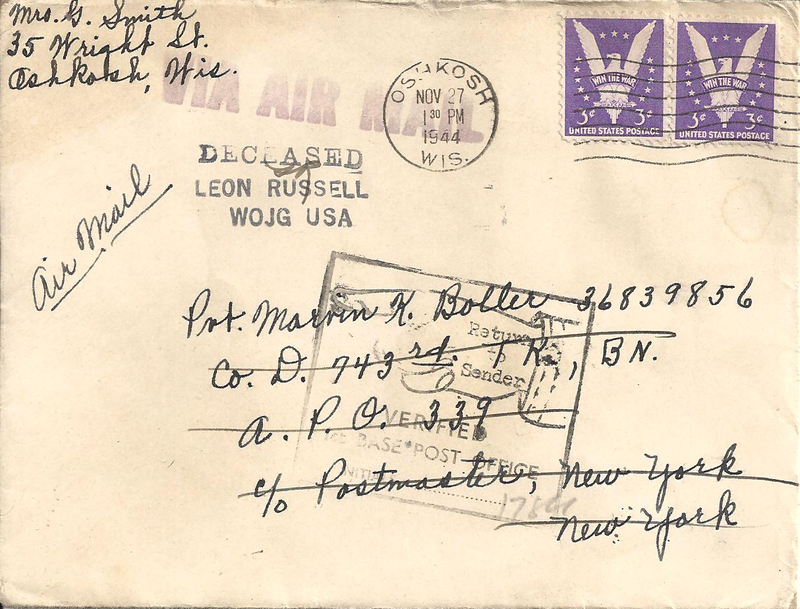 I wrote to Carrol Walsh, a liberator of the train near Magdeburg and a fellow member of Company D, and asked if he knew Boller; I also sent him this image of the envelope. Walsh and others would survive and go on to liberate Holocaust survivors on April 13th, 1945. And the letter has never been opened. I did not know you, I don’t know if anyone is alive who knew you, but you are not forgotten. More can also be seen here. In researching for my upcoming book on the liberation of the train, I are reminded of the sacrifices of the soldiers, again and again. Right now I’m revisiting a horrific incident that occurred just across Hitler’s “West Wall”, the so-called Dragon’s Teeth that formed the three-mile deep defensive fortifications that our troops had to cross to enter German soil. Resistance was stiff; on a cold and rainy day before Thanksgiving, 1944, several tanks of the 743rd Tank Battalion’s ‘D’ Company were wiped out in a muddy apple orchard a few miles across the border. Letter to Marvin Boller postmarked 5 days after his death. It remains unopened in a museum in Belgium. Thanks to Vincent Heggen, the curator. Walsh and others would survive and go on to liberate Holocaust survivors on April 13th, 1945. 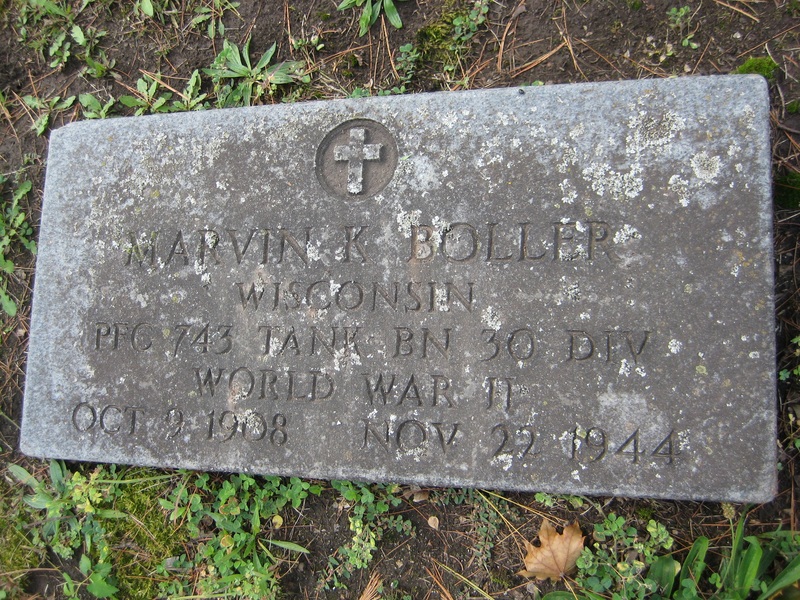 So here is a tribute to Marvin Boller, and all who fell. His body was returned to the United States. Rest on.